The former president's speech was neither sharp, nor intended to rub his hosts the wrong way. Former President Pranab Mukerjee's visit to Nagpur to attend the convocation ceremony of the Rashtriya Swayamsevak Sangh's Sangh Shiksha Varg — Tritiya Varsh, an annual event held to mark the culmination of a three-year training camp for swayamsevaks, went on expected lines. The event was telecast live on account of Mukherjee's participation with expert panellists speculating the motives behind RSS' unusual invite and more importantly, the former first citizen's acceptance of it. While Mukherjee quit active politics in 2012 to become the Indian president, his ex-party, the Indian national Congress, was embarrassed by his presence at the event as a lifelong Congressman. Only the preceding day, Sharmistha Mukherjee tweeted her vociferous disagreement with her father's decision to partake in the event and had warned of the BJP and its propaganda arm deriving advantage out of it. Even the Congress party wasn't amused as their efforts to talk him out of it didn't yield results. In fact, senior Congress leaders from Ahmed Patel to Anand Sharma had made their disapproval public. 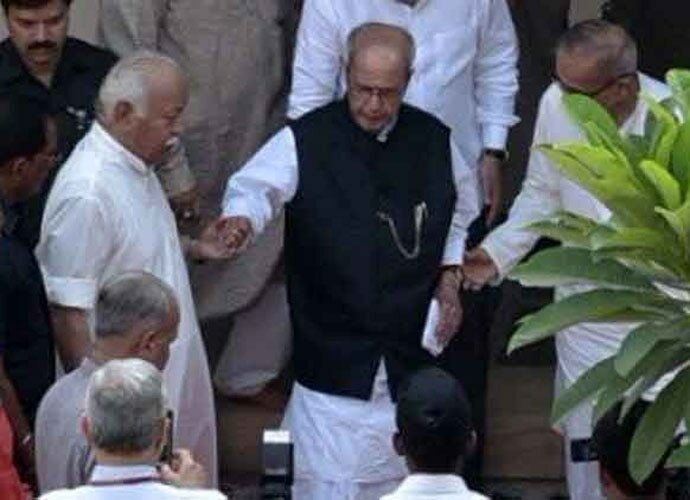 What further embarrassed the Congress was a note scribbled by Mukherjee in the visitor's book at RSS founder Keshav Baliram Hedgewar's birthplace. He wrote, "Today, I came here to pay my respect and homage to a great son of Mother India," which set alarm bells ringing in the grand old party. However, the worst fears of the party didn't come true as Mukherjee's speech was centred on the constitutional underpinning of nationalism accompanied by bits of Indian history. Regardless of Congress' own ambivalence post Mukherjee's speech, it is important to analyse the takeaways of his presence and how far he salvaged the situation with his speech. First things first: Mukherjee's acceptance of the invite itself was a victory for the RSS. Regardless of what he spoke, it was always going to be advantage RSS. While some people tend to reason that the RSS needn't seek legitimacy from any quarters post its ideological offspring BJP coming to power on its own in New Delhi, the argument is flawed as the Sangh is still perceived by many Hindus with suspicion and mistrust. While the BJP's ascent to power with a former RSS "pracharak" as the prime minister has given them respectability, it certainly doesn't give them the acceptability that they badly crave for. In a way, the invite to Mukherjee was also in continuum of the RSS' outreach to corporates and many upwardly mobile groups in recent times. This is in addition to the saffronisation of education, legislations to further their mission and other surreptitious programmes in states where they are in power. Coming back to Mukherjee, having accepted the invite, the best he could have done under the circumstances was to denounce the Sangh in their own backyard with no scope of a rebuttal on the occasion as protocol deemed he would be the last speaker. Instead, what was delivered was a textbook speech in Bengali-accented English and an alternative view of nationalism to the RSS' own narrow definition of it. While the speech was not bad, it was neither sharp, nor intended to rub his hosts the wrong way. In the end, it was rather boring and predictable. While his speech presented an alternative view of nationalism rooted in the Constitution, he seemed eager to borrow from the vocabulary of the Sangh to drive home his point. The oft-repeated "Muslim invaders" cliché of the Sangh and "Vande Mataram" to sign off the speech (along with "Jai Hind") are just a couple of instances. It can still be argued that he stayed true to his moderate self and said what he intended to say, albeit in a more agreeable way. But there were enough instances in his speech to demonstrate how disagreeable he was to the Sangh's worldview or its narrow constructs of national identity. "Any attempts at defining our nationhood in terms of dogmas and identities of religion, region, hatred, and intolerance will only lead to dilution of our national identity. Our national identity has emerged through a long-drawn process of confluence, assimilation, and co-existence. We derive our strength from tolerance. We accept and respect our pluralism. We celebrate our diversity. These have been a part of our collective consciousness for centuries," he asserted, leaving little ambiguity where he stood. While the Constitution of India is still internally viewed by the RSS as a document heavily influenced by western thought, Mukherjee dwelt upon it in detail and drove home its pre-eminent status. "The Constitution is not merely a legal document but it is the Magna Carta of socio-economic transformation. It represents the hopes and aspirations of billion plus Indians. From our Constitution flows our nationalism. The construct of Indian nationalism is constitutional patriotism, which consists of an appreciation of our inherited and shared diversity," he emphasised. Although the Sangh has often been duplicitous in their definition of "Hindu" and "Hindustan" in public proclamations, their literature and the books of Golwalkar leave no room for doubt. Mukherjee went on to speak about pluralism and demonstrated his secular convictions with, "Secularism and inclusion are a matter of faith for us. It is the perennial universalism of 1.3 billion people who use more than 122 languages and 1,600 dialects, practise seven religions, belong to three major ethnic groups — the Caucasians, Dravidians and Mongoloids — live under one system," in stark contrast to the "Hindi, Hindu, Hindustan" narrative of the Sangh. While recalling the 5,000-year-old civilisation that is India, he spoke how India and its definition of nationalism predate the western nation states and how the two concepts differ. Although it might leave some room for the RSS to appropriate this idea of nationhood as mirroring theirs, Mukherjee's distinction that Indians do not identify any enemy is in stark contrast to the Golwalkar's caricature of Muslims, Christians and the Communists as internal threats to the nation in We or Our Nationhood Defined. Perhaps, alluding to the socio-political atmosphere prevailing in the country, Mukherjee spoke of peaceful co-existence, compassion and harmony with nature forming the foundations of our civilisation. "Manifestations of rage are tearing our social fabric. Every day, we see increased violence around us. At the heart of this violence are darkness, fear, and mistrust." stopping short of denouncing the crimes against minorities and the series of lynching witnessed under the current regime. Mukherjee also invoked Nehru when he held forth on nationalism, "Nationalism can only come through the fusion of Hindu, Muslim, Sikhs and other groups." His invocation of Gandhi, however, was limited. It's not clear if it was deliberate as Gandhi's murder is a touchy issue with the Sangh since it puts its forebears in the dock. Despite trying their best to put that behind them in the last 70 years, it still remains an albatross around their neck. It is in this context that we need to recall Congress president Rahul Gandhi's date with the court on June 12 for his temerity to remind the current generation of the Sangh's shady past and its dubious role in the events leading up to the murder of the father of the nation. Didn't Mukherjee undermine his former party's political battle against the Sangh by this public engagement with them? While Mukherjee might choose to position himself beyond party politics, it still raises questions about his personal ambitions. Is he trying to say "Barkis is willing" just in case the joint Opposition can't settle on an amicable candidate in a post-election scenario in 2019? At a time Mahatir Mohammed came back to power in Malaysia as the joint opposition candidate at the ripe old age of 91, nothing can be ruled out. In any case, Mukherjee hasn't ever hidden his disappointment at being passed over for the position of prime minister in 1984 and again in 2004. Moreover, there is no constitutional bar for a former president from seeking the office of the prime minister. These might be speculations but politicians in India, with rare exceptions like Shankar Dayal Sharma, never retire till medical science fails. While Mukherjee's speech ran into 30 minutes, RSS sarsanghchalak Mohan Bhagwat's 40-minute speech preceding it also received equal attention. Setting the stage, Bhagwat spoke in chaste Hindi and tried to present a moderate face of the paramilitary-cultural organisation. He also tried to convince his audience-made up of the millions watching the live telecast on TV how the Sangh wanted a dialogue with citizens of different ideological persuasions. If this was meant to be a PR exercise for the Sangh, the Hindutva outfit is the only winner here - regardless of Mukherjee's assertions in his speech and the middle-path he struck.